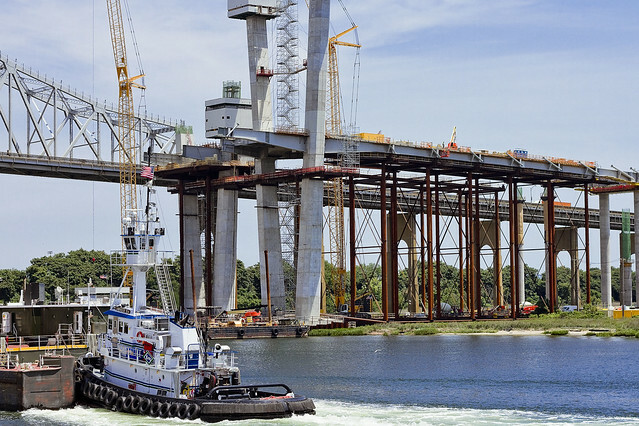 A short aside on the Arthur Kill, and a look at the Goethals Bridge project. For the last few days, I’ve been describing a day trip to South East Brooklyn, which we’ll return to later on, but for today’s post I want to show you what’s going on at the veritable edge of NYC on the western end of… Staten Island… at the Arthur Kill waterway. That’s the Goethals Bridge construction project you’re looking at, which is another one of the three mega projects involving bridges going on in NYC at the moment. I was actually “at work” when these shots were captured, conducting a corporate boat excursion for a group that wanted to “see something different” than what you normally get on a harbor cruise. They were all eating lunch on another deck as we passed by the Goethals so I grabbed my camera and got busy. I’m nowhere near as familiar with Goethals as I am with the Kosciuszcko Bridge over my beloved Newtown Creek, of course, but I can tell you that the span overflying the water is 672 feet long. 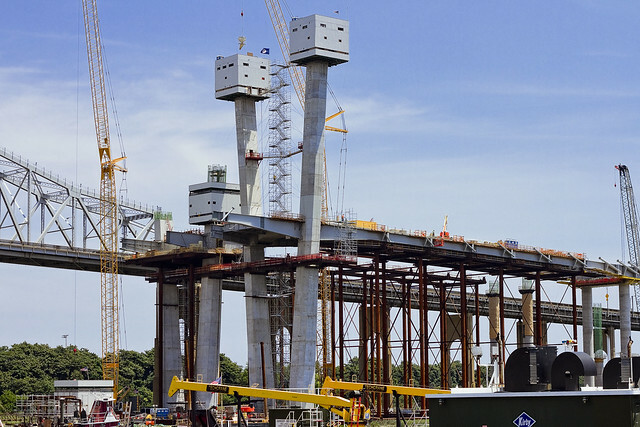 With its approaches, which connect Elizabeth, New Jersey (and the NJ Turnpike) to… Staten Island… the structure is actually some 7,109 feet long. It’s 62 feet wide, 135 feet over the Arthur Kill, and carries about 80,000 vehicles a day. Goethals opened in June of 1928, and along with the nearby Outerbridge Crossing, was the inaugural project for a newly created organization known to modernity as the Port Authority of New and New Jersey. Like several of the depression era bridges in NYC, Goethals has been deemed as being insufficient for the amount of traffic it carries, and it has developed some structural issues over the last century. 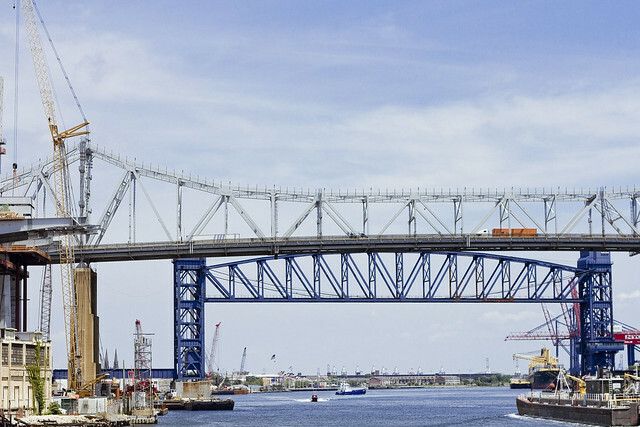 Port Authority is building a replacement bridge, which will be a cable stay type span. It’s going to be wider, have modern traffic lanes, and incorporate both bicycle and pedestrian access into its design. It’s also meant to be a “smart bridge” which will utilize active sensor technologies to monitor traffic and structural integrity. The PANYNJ has also left room in their designs for future modifications to the span like adding a rapid transit line. The blue bridge you see just north east of the Goethals is a railroad lift bridge which connects New Jersey’s CSX rail lines to the New York Container Terminal port facility on the… Staten Island… side. It’s called the “Arthur Kill Vertical Lift Railroad Bridge,” for the curious. That’s the Elizabeth, New Jersey side, where the Goethals connects to New Jersey’s “Chemical Coast.” It’s called that for the enormous presence of the petroleum industry in Elizabeth. This area was formerly the property of the Standard Oil Company of New Jersey. 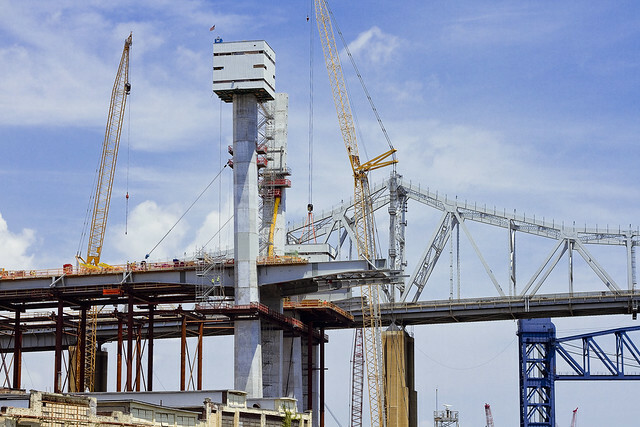 The new Goethals Bridge is meant to be ready for use in 2018, at which point the PANYNJ will begin the demolition project to get rid of the original. The 1928 steel truss cantilever bridge was designed by a fellow named John Alexander Low Waddell, who also designed the nearby Outerbridge Crossing. As a note, Outerbridge Crossing is not called that due to it being the furthest out bridge, as colloquially believed. It’s named for a a guy named Eugenius Harvey Outerbridge, and I’m friends with his grandson Tom. The Goethals Bridge(s) is named for General George Washington Goethals, superviser of construction for the Panama Canal, and first consulting engineer of the Port Authority of New and New Jersey. The PANYNJ has a neat website set up for the project which includes live construction webcams, check it out here.